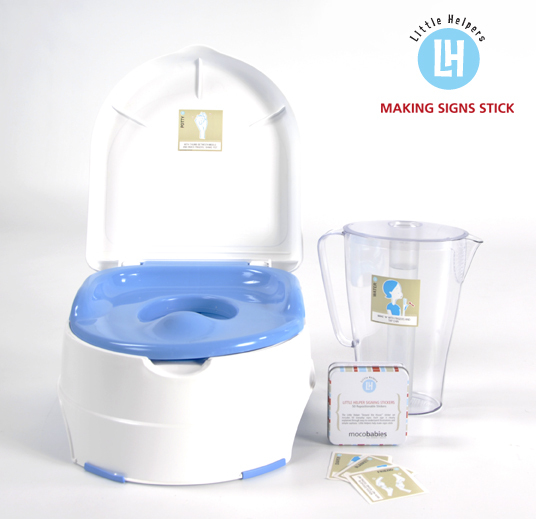 Our Little Helper Signing Stickers are one of the best tools for bringing sign language into the home, getting family involved and making it incredibly easy to remember to use signs as part of your communication with baby. Our Little Helper stickers are near and dear to me. They are essentially the idea that started mocobabies. I attended a workshop and took a class, yet, I would still forget some of the signs. I wanted to sign ‘good night’ to my son so I scribbled a note by his crib as a little reminder. It worked. Not only did I remember but I noticed that my husband started signing it as well. More incredibly, people who were (pretty vocal) skeptics started to sign when they had my scribbled reminders nearby. Another bonus for me was not always having to tell everyone how to make each gesture. We now pick out the signs that Lily is using when the kids are going somewhere for the weekend so that grandparents and aunts and uncles know what she is trying to say and how to make the signs back! They’re great. Such an easy way to use baby sign language and get the whole family involved. Yes, our stickers are repositionable. Truly repositionable. For months our walls were covered in different materials, each scribbled with the date of the last time it was moved as well as details of how well they moved, how well the sticker fared and what kind of residue may have been left behind. We did this until we were down to the material that is now our Little Helper stickers. They have been been all over our walls, doing our best to ensure they won’t damage yours. They are in our fridge on the water and milk jugs, on our walls and in our bath. The stickers we have in our bath right now (hot, water and bath) are on the tile far enough in that each day they get wet with 2 showers and endure the children’s bathtime splashing. They have been up since we moved (about 2 months). They are holding tight and still reposition onto dry tiles with no problem. I have found that the best way to get people to participate is to make it as effortless as possible and our Little Helper Signing Stickers do just that. Where do you purchase the stickers?